The early history of the novel has not been written yet. The oldest representatives of this genre (also called ‘ancient romances’ in scholarship) were written in Latin and Greek in the first few centuries of the Common Era. 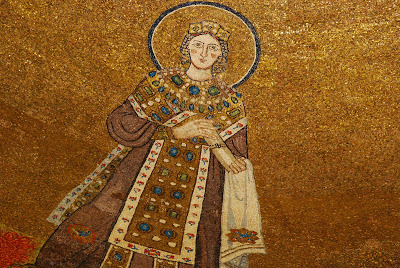 Often, scholars have observed an interim period between the fourth and twelfth centuries from which no novels are said to have been preserved, and identify a so-called ‘re-emergence’ of the genre in Byzantium. Building on recent research that studies hagiography as literature, this conference of the ERC project Novel Saints (Ghent University) aims to challenge this view by studying hagiography as a continuation of novelistic literature during the so-called ‘dark age’ of the novel. A number of texts from this period have already received attention for their novelistic qualities, such as Ps-Nilus’ Narrationes, Ammonius’ Report on the Slaughter of the Monks of Sinai and Rhaithou, the Historia Monachorum, Palladius’ Historia Lausiaca, The Martyrdom of Galaction & Episteme, Jerome’s Lives of Malchus, Paul and Hilarion, and the Syriac Life of Abraham and his Niece Mary. Moreover, both ancient fiction and some of these (and other) hagiographical narratives are known to have impacted medieval romance (e.g. Metiochus and Parthenope as a source for the Persian love romance Vāmiq & ‘Adhrā and the Life of Saint Eustace/Placidas for chivalric romance in the West). 3) medieval romance in the West, Byzantium or Persia. • conceptualizations of overlaps and similarities between novels and hagiography. Which theoretical concepts, tools or frameworks are useful to do so? • generic awareness: which are markers in hagiography that proclaim awareness of the novelistic tradition, indicate affinity with and/or a distance from it (or vice versa in the case of later novels)? To what extent and how do writers of novels, hagiography and/or romance present themselves as belonging to a particular genre and/or narrative tradition? • the usefulness of the concept of genre: how useful is our current generic classification, labelling texts as ‘novels,’ ‘romance’ or otherwise, and establishing and promoting distinctions between ‘novels,’ ‘romance,’ ‘fictional biography’ and ‘hagiography;’ between ‘core novels,’ ‘fringe novels;’ ‘family romances,’ and ‘hagiographical romances;’ between ‘epic passions’ and ‘historical passions,’ etc.? Are there alternative ways to think about and study these texts and their interrelations? Please send your abstracts to Flavia Ruani (flavia.ruani@ugent.be<mailto:flavia.ruani@ugent.be>) by 15 April 2018. Abstracts (350 words max, in English or French) should include name, title of proposed paper, affiliation, and position. Notification about participation will be emailed by 15 June 2018. For further queries, please contact flavia.ruani@ugent.be or tine.scheijnen@ugent.be.